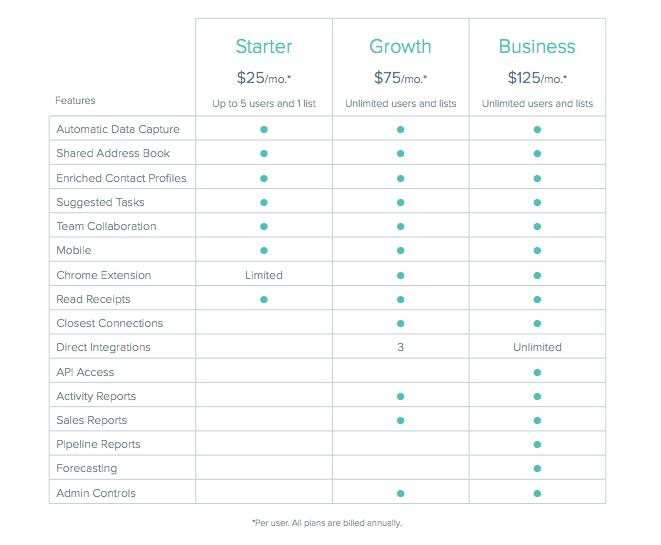 SalesforceIQ CRM plans are offered at Starter, Growth, and Business levels. The features available at each level are shown here. *Note: You can see what your Organization's subscription plan is within the SalesforceIQ app by clicking > Settings > Billing > Billing Details. Download this comparison chart here. For more information about our billing plans, see the billing FAQ. Are you a Starter customer interested in learning more about the SalesforceIQ Growth plan features? If so, watch the video below! Help Articles - Find answers to any of your questions. Onboarding Resources - Follow the onboarding series to get started. Live Webinars - Attend sessions hosted by our Customer Success team. Technical support is available via email to all SalesforceIQ CRM users Monday through Friday, 8:30 am - 5:00 pm Pacific Time. Click here to submit a support case. After you submit a case, you will receive an auto-notification email that the case has been received by our SalesforceIQ Support Team. We will reach out to you within one business day. This article answers questions you might have about SalesforceIQ CRM's billing plans. You can also check out our plan comparison and learn how to view or change your plan. What happens when I remove a user from SalesforceIQ CRM? Do I lose all of their communication history? No. If you remove a user from SalesforceIQ CRM, that user's communication remains in the Stream. What is a direct integration? Direct integrations don't require any custom coding. Direct integrations in SalesforceIQ CRM currently include Mailchimp, Hubspot, Pardot, and Zapier. You can find them under Create Direct AutomatIon Integration on the integrations settings page. Zapier is an integration solution that lets business users create integrations from third-party applications to SalesforceIQ CRM. Learn more about the types of integrations here, and about getting started with Zapier here. How many Zaps can I have in the Growth plan? When you set up the direct integration with Zapier from the integrations page, SalesforceIQ CRM provides you with an API Key and Secret. You can use these with any number of Zaps. Please note that Zapier has an additional cost. What credit card types does SalesforceIQ accept? SalesforceIQ accepts Visa, Amex and Mastercard. How do I change my account information—credit card on file, billing contact, email address, etc.? Please contact the Salesforce Billing Team to update your account information. Do I get Customer Success support with the Starter plan? The Starter plan does not come with the support of our Customer Success team. If you have any questions about how to use or optimize SalesforceIQ CRM, please consider attending our webinars and live trainings. Can I pay for my plan in my local currency? Yes. If you would like to use your local currency to purchase your SalesforceIQ CRM plan, please contact us for pricing and information. Are VAT or any other taxes included the list price? SalesforceIQ does not charge tax or VAT on our invoices for customers who provide an address outside of the U.S. However, customers are still responsible to remit all taxes or VAT to their government per the Salesforce MSA.